Members of the cast of the Western Gold Theatre production of Mystery at Greenfingers. Mystery at Greenfingers has nothing to do with gardening, except that more than one character fertilizes the plot as it thickens in J. B. Priestley’s parody of a murder mystery. Instead, ‘Greenfingers’ in the title refers to the Greenfingers Palace Hotel, where a skeleton crew of staff preparing for the upcoming season is trapped in a snow storm, along with three guests. No ordinary guests though, as one of them, a hotel detective on a secret mission, eventually discovers. 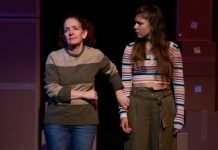 Presented as a very well-staged and rehearsed reading rather than a full performance, some late cues and slight hiccups handling scripts meant Greenfingers ran for longer than any comedic whodunit should. A little nip and tuck tightening might improve it. The company can only have chosen to read the script rather than learn it because of the complexity of the plot and verbosity of the period, thus making the dialogue difficult to learn in the allotted rehearsal time. It was published in Britain in 1938, so some of the cast found it more difficult than others to lift the words from the page, to keep their places and not stumble. However, there were delightful moments when the carried scripts were used to comic effect. A case in point: when one character fainted and had to be removed by his fellow actors, they slapped their scripts down in a stack on his well-proportioned tummy before they picked him up and hauled him away through the auditorium doors. Those doors were frequently used for other exits and entrances too. In fact, skilful director Anna Hagan missed no opportunity to keep the pace and flow as characters appeared and disappeared from every angle and orifice in the simple but workable set, appropriately and effectively designed for both period and action by Glenn MacDonald. Despite the fact that Priestley has his characters address each other by name, he rarely identifies the roles they play in the hotel hierarchy. The program notes don’t offer clues either, nor do they list the characters in order of appearance. As a result, clarifying who does what presents a challenge and splits focus, particularly at the beginning of the play. Other performances of note were those of Dave Campbell as the alcoholic French chef who loves to mime to opera and hates British food, especially preparing it. Tanja Dixon-Warren does an outstanding job as Sally Phillips, the sassy, outspoken maid who has it in for the incompetent hotel detective played most competently by Robert Crowther. Colleen Winton as Mrs Rose Heaton, the over-efficient, opinionated housekeeper who nurses an intriguing secret, brings a fresh energy that appeals. Her accent meanders a little between Londonderry and Edinburgh but the rhythm of her speech fits the character perfectly. According to the program, the actors costumed themselves and are to be congratulated on their choices. One small note though, Sean Sonier, who plays the hotel’s inexperienced assistant manager might have considered changing his appearance to one more in keeping with that of a young man in that position in the 1930s. It’s a lot to ask for four performances, but a wig and moustache instead of a shaved head and beard might have been more appropriate. 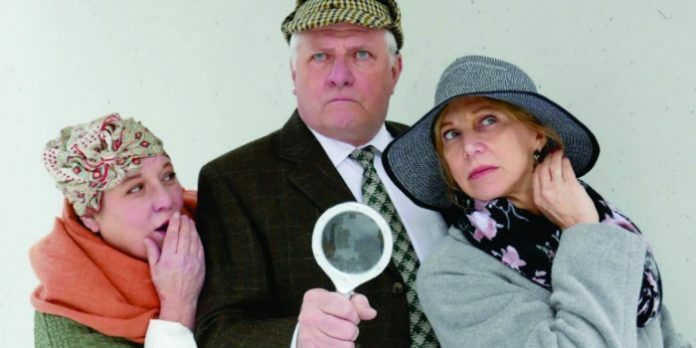 Such niggles aside, Mystery at Greenfingers, described by Priestely as ‘a comedy of detection,’ entertains in the old-fashioned style of good clean family fun, and that in itself is refreshing. Mystery at Greenfingers by J. B. Priestley. Directed by Anna Hagan. A Western Gold Theatre production. On stage at the PAL Studio Theatre (581 Cardero St, Vancouver) until March 24. Visit westerngoldtheatre.org for tickets and information.